Fasting Days™ is formulated by Reginald Friesen M.D. 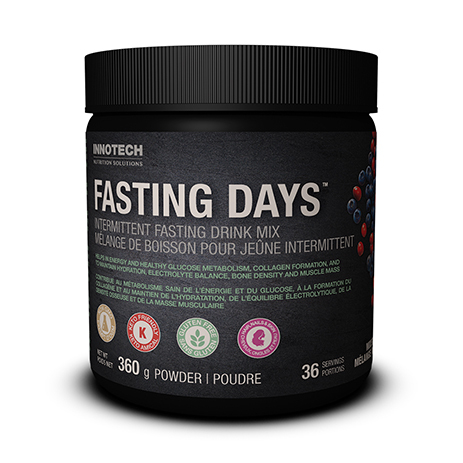 and Innotech Nutrition to help support Intermittent Fasting with a balanced nutrient powder. Low in calories (Keto Friendly), non-GMO, non-dairy and free of sugar, gluten, MSG, artificial sweeteners, artificial flavours and colours. With 10 grams of amino acids, 13 vitamins and minerals including your daily electrolyte requirement. Drink this during your 18-20 hour fast. Fasting Days™ is formulated by Reginald Friesen M.D. and Innotech Nutrition to help support Intermittent Fasting with a balanced nutrient fortified powder mix that is mixed into water. It is low in calories, non-GMO, non-dairy and free of sugar, gluten, MSG, artificial sweeteners, artificial flavors and colors. With 10 grams of amino acids, 13 vitamins and minerals including your daily electrolyte requirement, this product helps support the body’s natural ability during your fasting hours. Naturally sweetened. Recommended Purpose: Helps in energy metabolism, to maintain normal blood glucose levels, connective tissue formation, proper muscle function and to maintain normal electrolyte balance. Directions for use: Consume “Fasting Days” 1-3 times per day during your fasting hours. Mix 1-2 scoops (10-20 grams) with 16 oz (500ml) of water. Follow with a glass of water and remember to consume 8-10 glasses of water per day. 36 x 10 gram servings per container. $1.55 per 10 gram serving. Fasting Option #1: Fast 18-20 hours with the help of “Fasting Days” and eat a healthy diet in your 4-6 hour eating window. Fasting Option #2: Alternate Day Fasting – Fast for 24 hours with the help of “Fasting Days”, followed by a healthy diet for the next 24 hours. Repeat. Fasting Option #3: Fast for two days with the help of “Fasting Days” and then eat a healthy diet for 5 days which can include “Fasting Days” as a low calorie healthy beverage whenever desired. Repeat cycle. EAAs Increase Fat Burning and Support Fat Loss – A large cohort study of 4,429 people found that the individuals with the highest EAA intake had the least body fat, the most muscle, and the best body composition . EAAs Support Hormone Balance During Times of Stress – Supplementing with EAAs supports optimal hormone balance, which plays a major role in body composition, endurance and recovery. A human clinical study found that supplementing with 6 grams of EAAs raised testosterone levels and lowered biomarkers of inflammation in comparison to the placebo group . EAAs Improve Insulin Health & May Reduce Diabetes Risk – EAA supplementation has been shown to support insulin sensitivity and metabolic rate resulting in improved body composition. For example, a recent weight loss study found that the individuals who had the highest EAA intake had the greatest improvements in insulin sensitivity . L-Carnitine is the amino acid responsible for transporting long-chain fatty acids into the mitochondria. Without sufficient amounts of carnitine, fat can’t get into the mitochondria to be burned for fuel. L-Carnitine-Tartrate helps in fat oxidation and improves muscle endurance by preserving muscle glycogen storage and preventing the buildup of lactic acid. Next to glutamine, taurine is the second most abundant amino acid found in skeletal muscle. Taurine acts as osmolyte (i.e., it regulates fluid balance). As such, taurine optimizes cellular hydration. Taurine also regulates water and electrolytes in the blood, playing an essential role in preventing muscle cramping. Taurine also has significant antioxidant properties and alters the actions of inhibitory neurotransmitters, which increases brain performance, focus and mental acuity. L-Tyrosine is an amino acid that is metabolized to produce neurotransmitters such as dopamine and adrenaline. Increasing levels of these neurotransmitters cause improvements in cognitive function, physical performance, metabolic rate and fat loss. L-Theanine is an amino acid naturally found in teas and mushrooms. Theanine supplementation causes the release of the brain neurotransmitter gamma-aminobutyric acid (GABA). GABA boosts mood and mental focus. L-Theanine supplementation is used as a natural remedy to help treat depression since it reduces feelings of anxiety and promotes an overall sense of well-being. L-Alpha-Glycerophosphoryl Choline (Alpha GPC) is a choline-containing phospholipid that enhances cognitive function, increases strength and stimulates the release of growth hormone. Studies backing all the way back to the 1990’s have shown that supplementation of Alpha GPC improves memory . Studies have also shown that a single supplemental dosage of Alpha GPC can increase acute growth hormone levels 290% above baseline in healthy adults . The cumulative evidence from animal and human studies support the role of Alpha GPC as a well-tolerated cognitive enhancing compound with additional therapeutic benefits . L-Glutamine is the most abundant amino acid in human plasma and plays a vital role in the health of the immune system, digestive tract, and muscle cells. Stress, infection, surgery, and trauma can deplete the body’s glutamine reserves, particularly in muscle cells. Supplementing with glutamine will provide a boost to your immune system and reduce stress. For example, a double blind placebo controlled study found that the adults given oral glutamine supplementation caught less infections and had improved ratio of T-helper/T-suppressor cells compared with the placebo (Castell & Newsholme, 1997). 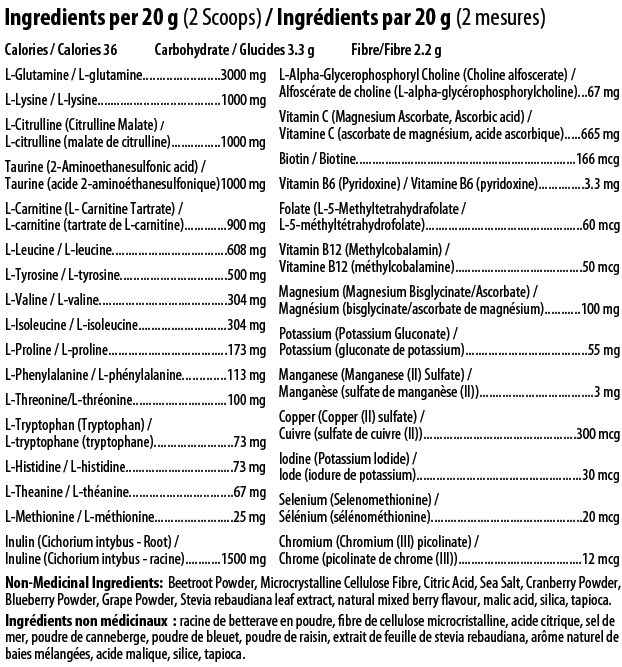 Methylcellulose is a non-allergenic and non-fermentable fibre that is created from the cell wall of plants. It is not absorbed by the intestinal tract but instead absorbs water to create a softer stool. Citrulline malate is an amino acid made from binding two molecules of L-citrulline to an ester of malic acid (malate). Supplementing with citrulline malate increases the synthesis of nitric oxide (NO) in the blood, which dilates blood vessels, increases blood flow, regulates glucose uptake and optimizes mitochondria function. This increases nutrient delivery and waste product clearance from working muscles, improving muscle function and reducing fatigue. Citrulline supplementation has also been shown to increase human growth hormone (HGH) levels. L-Proline is an important amino acid responsible for cellular regeneration, tissue repair, and collagen building. It has beneficial cardiovascular properties, working to support balanced blood pressure levels and arterial elasticity. Bodily functions like muscle contractions and transmission of nerve impulses depend on electrolytes. Magnesium – Magnesium is the fourth most abundant cation in the body and is needed by every cell in the human body. Magnesium is needed for nerve transmission, muscle contraction, blood coagulation, energy production, nutrient metabolism, bone integrity and cell formation. Low blood serum levels of magnesium have been associated with a number of chronic diseases including diabetes, hypertension, coronary heart disease, and osteoporosis (Kass, Weekes, & Carpenter, 2012). Potassium – Potassium is the third-most prevalent mineral in the body and is needed for muscular contractions, blood pressure regulation, fluid balance, bone growth and nutrient digestion. The Food & Drug Administration recommends adults to consume 3,500 to 4,700 milligrams per day, yet only 2% of the American population actually consumes this quantity . A meta-analysis that included 11 studies and 247,510 participants found that higher dietary potassium intake was associated with lower rates of stroke, reduced risk of coronary heart disease and cardiovascular diseases (D’Elia, Barba, Cappuccio, & Strazzullo, 2011). Manganese – Manganese is a trace mineral that is required for the normal functioning of your brain, nervous system and many of your body’s enzyme systems. Manganese is a part of the antioxidant enzyme superoxide dismutase (SOD), which is arguably one of the most important antioxidants in your body . Antioxidants help protect against free radicals, which are molecules that can cause damage to cells in your body and contribute to aging, heart disease and some cancers. Biotin – Biotin is a B vitamin that help the body metabolize fats and carbohydrates. The word “biotin” comes from the ancient Greek word “biotos,” which means “life”. B vitamins, and specifically biotin, help keep your hair, skin, eyes, liver and nervous system healthy. Biotin is particularly important during pregnancy as its important for embryonic growth. Copper – Copper is an essential trace mineral that is found in all body tissues and plays an important role in making red blood cells and maintaining proper nerve cell communication. Copper also plays an important role in maintaining collagen and elastin, major structural components of our bodies. Methylated Folate – Folate helps the body metabolize proteins, form red blood cells, and regulates the metabolic process of lowering blood serum homocysteine levels, which prevents oxidative stress and atherosclerosis. Human studies show that a low folate intake is associated with an increased risk of stroke (Zeng, Xu, Xu, Wang, & Wang, 2015). Aside: why methylation matters – It is estimated that up to 30% of the population is unable to metabolize the unmethylated forms of Folate and Vitamin B12. The active forms of these B vitamins are referred to as the methylated form. This is the form that your body can actually utilize. Iodine – Iodine is an essential mineral commonly found in seafood. Your thyroid gland use iodine to make thyroid hormones, which control growth, repair damaged cells and support a healthy metabolism. It is estimated that up to a third of people worldwide are deficient in iodine . An iodine deficiency can cause side effects like weight gain, fatigue, hair loss and constipation. Selenium – Selenium is an essential mineral that has been shown to prevent cardiovascular disease and other chronic diseases by increasing enzymatic antioxidant activity and decreasing lipid peroxidation. The selenium content of food varies greatly geographically depending on the soil, water concentrations and use of selenium-containing fertilizers. The transportation of foods decreases vitamin and mineral content so people living in climates where the majority of their food is imported are at greater risk of selenium deficiency (Fellers, 1935). Chromium – Chromium is an essential trace mineral that is becoming popular as a dietary supplement because good dietary sources of chromium are limited and intake is generally low. Chromium augments the actions of insulin, which controls blood sugar levels. Research shows that keeping blood sugar levels stables enhances fat loss, decreases appetite and even helps ward off several chronic diseases like heart disease and diabetes. In one study looking at the blood sugar responses to a carbohydrate meal of white bread, the addition of 400 micrograms of chromium resulted in a 23% reduction in blood sugar after the meal . Vitamin C is a powerful anti-oxidant that helps improve the efficiency in which the body uses oxygen. This allows the body to more easily adapt to stress. In addition, vitamin C helps the body metabolize fats and proteins, allows for proper wound healing, and is essential for the production of high quality collagen and connective tissue. The role of vitamin C in the production of collagen is to interact with amino acids within collagen cells. In particular, it adds hydrogen and oxygen to the amino acids needed to make collagen. If you don’t get the proper amount of vitamin C, collagen production will slow. A decline in collagen production leads to the development of unwanted wrinkles and the appearance of aged skin . Vitamin B6 is water soluble B-vitamin that is involved in over 100 reactions in the human body. Vitamin B6 helps support adrenal function and regulates the production of neurotransmitters, chemicals that allow brain and nerve cells to communicate with one another to ensure that metabolic processes such as fat metabolism and energy production run smoothly. Vitamin B12 is a water soluble B-vitamin that is needed for proper metabolism and red blood cell formation. The primary function of red blood cells is to carry oxygen to body tissues. Vitamin B12 supplementation is clinically shown to cause boost energy levels, reduce fatigue, and improved cognitive function. Duration of Use: Consult a health care practitioner prior to use beyond 6 months. Contraindications: Do not use if you are pregnant or breastfeeding. Known Adverse Reactions: Hypersensitivity has been known to occur. Store in a cool, dry place. Innotech Nutrition is not responsible for the use or mis-use of this product pertaining to the directions. Tamper proof seal, do not use if broken or removed. Autophagy (“self-eating”) is a detox process your body undergoes to clean out damaged cells and regenerate new ones. The benefits of autophagy include reduced inflammation, improvement in daily bodily function, prevention of neurodegenerative diseases, and increased longevity. Ketosis is a normal metabolic process that occurs when the body does not have enough glucose for energy. Instead, it burns stored fat for energy. This makes your body’s primary energy source stored body fat. Ketosis also promotes improved mental health since there are no blood sugar swings and ketones cause less oxidative stress than glucose. Hormesis is the body’s adaptive mechanism to mild stress. This will trigger protective metabolic pathways such as AMP-activated protein kinase (AMPK) that increase mitochondrial density and boost the immune system. The key trigger for all of them is energy deficit and glycogen depletion. Fasting ketosis can happen as soon as your liver glycogen stores have been depleted and your liver starts producing ketone bodies. It takes roughly 16-20 hours for your liver glycogen to be depleted. Mild autophagy can occur as soon as you suppress mTOR by keeping insulin and blood sugar very low. However, you need to be fasting for at least 24-48 hours to trigger a significant response. AMPK gets triggered when your body needs to generate energy in a fuel deprived state. Fasting and glycogen depletion put you into a caloric deficit, which then ramps up your body’s adaptation mechanisms. What breaks a fast while intermittent fasting? Will lemon water kick me out of a fasted state? Can I drink bulletproof coffee while fasting? Do 100 calories break a fast? Small amounts of calories don’t raise insulin levels significantly enough to kick you out of ketosis. It’s the endogenous ketones that your body creates in a fasted state that stimulate autophagy , also which promote macroautophagy in the brain . In conclusion, use common sense and understand that the fasted state and the positive effects that result from it isn’t an on/off switch, or an ‘all-or-nothing’ kind of deal. The small number of calories found in a greens drink, essential amino acid supplement like Fasting Days™, lemon water or black coffee/tea will not break your fast or kick you out of ketosis. Isn’t It Unhealthy to Skip Breakfast? No. Most stereotypical breakfast skippers have unhealthy lifestyles. Skipping breakfast in itself is not unhealthy. Yes. However, some supplements like fat-soluble vitamins may work better when taken with meals. Can I Work out While Fasted? Yes. However, it is recommended to consume a drink that contains essential amino acids (EAAs) like Fasting Days during a workout while fasting to prevent muscle loss. All weight loss methods can cause muscle loss which is why it’s important to lift weights and keep dietary protein intake high. Generally speaking, muscle loss during fasting isn’t a concern unless you are fasting for periods greater than 24 hours. Will Fasting Slow Down My Metabolism? No. Studies show that short-term fasts actually boost metabolism. However, long duration fasts of 3 or more days can suppress metabolism. Helps in collagen formation to maintain healthy bones, cartilage, teeth and/or gums. Jason Fung MD from Toronto on Intermittent Fasting for Type 2 Diabetes and weight loss. Klein J, Gonzalez R, Köppen A, Löffelholz K. Free choline and choline metabolites in rat brain and body fluids: sensitive determination and implications for choline supply to the brain. Neurochem Int. 1993;22(3):293-300. Kawamura T, Okubo T, Sato K, et al. Glycerophosphocholine enhances growth hormone secretion and fat oxidation in young adults. Nutrition. 2012;28(11-12):1122-6. Traini E, Bramanti V, Amenta F. Choline alphoscerate (alpha-glyceryl-phosphoryl-choline) an old choline- containing phospholipid with a still interesting profile as cognition enhancing agent. Curr Alzheimer Res. 2013;10(10):1070-9. Ryan GJ, Wanko NS, Redman AR, Cook CB. Chromium as adjunctive treatment for type 2 diabetes. Ann Pharmacother. 2003 Jun;37(6):876-85.2.